A Little Pig Production, UK, 2005. 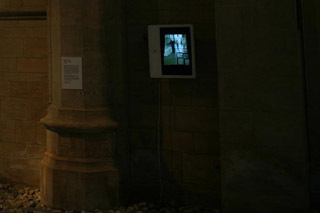 Exhibited as part of Net:Reality, 20-21 Visual Arts, Scunthorpe, UK, 2005. 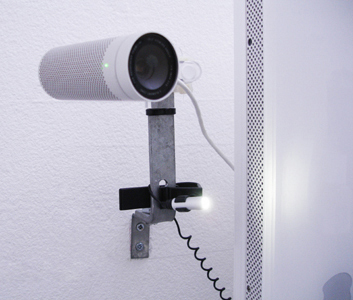 IDphone evokes an ambivalent conjunction between the Freudian notion of the Id, contemporary I.D. systems (biometrics) and a video-phone gone wrong. Employing digital "mirrors" that reflect imagery from two different locations the artwork functions as a portal to somewhere/someone else. 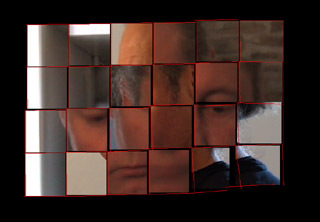 Viewers look into 2 screens, located in different spaces, and are confronted with a blended and distorted 'portrait' of themselves and an unknown other. 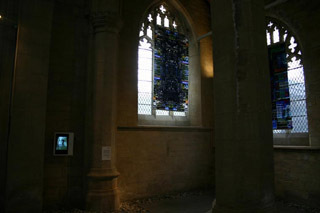 The piece is realised using two computer screens, each with a video camera connected to it and focused on the area in front of the screen. The computers process the video and update various areas of the screens at regular but random intervals. When an area is updated it is also wirelessly relayed to the other computer so that it also updates that area, but with the image from the other computer. 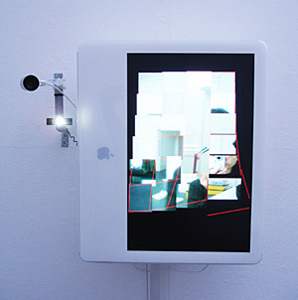 The video signal on each computer is also analysed in real-time for viewer presence and movement. 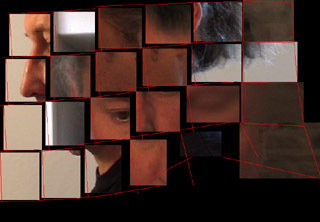 This data is then used to distort the image on each screen. You can download (Mac OSX only) a client-side version of IDfone. This is fully functional. Ensure you have a functioning webcam connected to your computer's Firewire port and an active (broadband) internet connection. Then double click the application. You should be taken through a server-side log in procedure, which you must click to accept. If everything is working you will then be able to see fragments of your local video camera signal displayed on your screen. If anybody else is logged on to the server, also with a video camera connected, you should see the fragmented signal from their video signal. They, of course, should also be able to see your signal. Any substantial movement or change in the video image (physical movement, lighting change, etc) will cause your local video image to become distorted. This effect is local only - other viewers logged on will not see your distortion (only their own).